Bird migration deaths have people taking action, Steven Romo reports. GALVESTON, Texas (KTRK) -- A petition is gaining steam calling on the city of Galveston to adopt an ordinance requiring buildings to keep their lights off to help birds survive migration. In May, nearly 400 birds were found dead outside the American National Insurance building. Richards Gibbons, Houston Audubon conservation director, said they were likely disoriented by the building's lights, though that concentration of birds is highly unusual. "Many people don't know. There are hundreds of thousands some nights, passing over while we're asleep, especially in April," Gibbons said. He said hundreds of bird species migrate at night and rough weather can force them closer to the ground. "When that happens, they run into obstacles," Gibbons said. 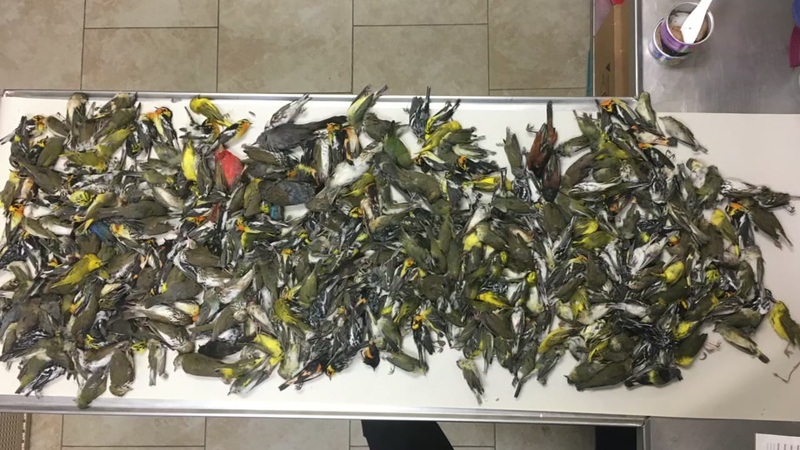 The incident last month was extreme, with 395 songbirds of different types found dead at One Moody Plaza. The migratory birds were found after they flew into the American National building. Gibbons said a possible, partial solution is turning off bright building lights above 50 feet, because they interfere with birds' navigation. "It is counter-intuitive, but birds, because of their instinctual wiring, are attracted to light during their nighttime migrations," he said. More than 25,000 people agree that buildings should shut out the lights to help birds, signing a petition to make it a city ordinance. A city representative said that's not likely to happen. The American National Insurance building is voluntarily turning its lights off and the city believes its the only building that poses a risk to birds. Still, Gibbons said it's encouraging to see so many concerned about wildlife. "I think it sends a signal to our business leaders that we'd like communities that are friendlier to wildlife," he said.